Photo taken by Al Case: Chloee Hunt from Evergreen State attempting a block on Makayla Hoyt’s spike. Southern Oregon University’s volleyball team made a two appearances this weekend against Northwest University (L 3-0) and The Evergreen State (W 3-2). Despite the loss, the team is still seated No. 4 in the conference. The Raiders had a tough beginning to the weekend Friday evening against The Eagles. Raiders lost 27-25, 25-20, 25-22 which made this their first defeat of the season and ended their four match winning streak. The first set was close with 10 ties. The Raiders defending set points twice, but the Eagles pulled away with Audrey Saelens’ kill and Alysanne Van Dyke’s ace. SOU recovered in the next set, establishing a 10-2 lead with eight kills from Makayla Hoyt. The Eagles, however, pulled away scoring the following seven points. With SOU trailing 20-19, they made four attacking errors. This allowed the Eagles pulled ahead to secure a 25-20 victory. The third set began with SOU in control leading 15-13, but then, Northwest responded with eight more points while SOU scored two. Leading the Northwest team included Sarah Warner with 10 kills and Amanda Waterman with 11 kills, 10 digs, and one ace. For the Raiders, Makayla Hoyt secured eight kills, three blocks, and one ace while Elliott Cook and Dani Cook each produced seven kills. 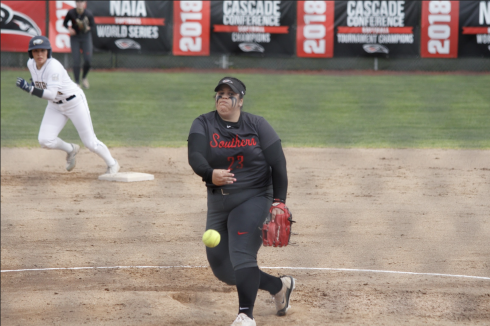 With their first loss since the beginning of the month behind them, the Raiders came back with a vengeance Saturday evening against Evergreen State. SOU switched off set victories in this five set match with a 25-23, 23-25, 25-20, 18-20, 15-7 win against the Geoducks. Hoyt came back strong Saturday with 17 kills and 6 blocks while Dani Johnson put away five kills in the final set to secure the Raiders’ victory. Elliott Cook, a freshman, produced 11 kills and 6 blocks while Taylor Ristvedt had 10 kills. SOU also saw good plays from Emma Ryan who had 8 digs and 3 service aces– a career record. Ashlyn Flynn secured 23 digs, and both Hannah Bogatin and Natalie James combined for 51 assists. 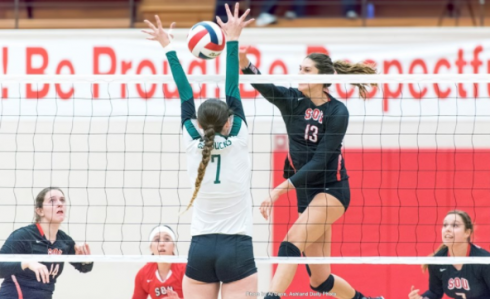 On the other side, Evergreen’s Natalie Taylor recorded 18 kills, Chloee Hunt 14, and Bethanie Nelson with 13 while Matalsi Laban had 58 assists. On defense, Hunt also held off the Raiders with 6 blocks. The Raiders will play in Eugene this coming weekend against No. 6 Northwest Christian.